A dog stroller may not seem like the most useful accessory for your pup, but there are some pretty good reasons to get one. A dog carriage can have lots of benefits for your bonding experience, and the best pet strollers for dogs can alleviate health risks as well. But how do you know which pet stroller to get and what accessories or features to look for? That’s a pretty common question when shopping for pet supplies, and doggy strollers are no exception. In this buying guide, we will not only be looking at the top five strollers currently on the market and why you should consider them, we will also be looking at all of the other factors that you have to evaluate when it comes to buying the right dog stroller. Let’s take a look at some of the top dog strollers on the market first. You have to be able to evaluate a dog stroller individually if you want to make a buying decision, but that means learning the information that you need and taking the time to do some research. For those who simply want a recommendation on the best dog strollers out there, we have come up with five that represent the best of the market right now. The first one on the list is this Pet Gear no-zip pet stroller. People get pet strollers for lots of different reasons. Pet strollers can help when your dog is not able to keep up with you on a walk because of advanced age or arthritis or if they are not able to walk because they are recovering from an injury. Strollers have other functions as well that you may discover the more that you use them. This particular stroller has a number of advantages that you will really like. 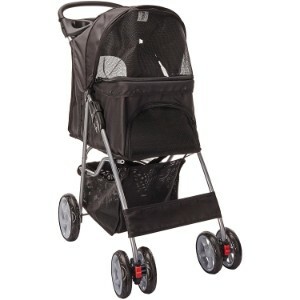 It has plenty of extras that make it one of the best pet strollers to get. One of the features that you will really love is the no-zip technology. This no-zip designs is one of the most innovative features when it comes to pet strollers. The no-zip feature means that there is a latch that locks instead of a zippered closure. The problem with pet strollers and zippers is that you can easily grab your pet’s fur and caused them pain or injury went trying to enclose them into the stroller. In addition, zippers often get stuck and have to be cut free or torn free which ruins the stroller forever. That’s not the case with this stroller because it uses an entirely different mechanism to close up. 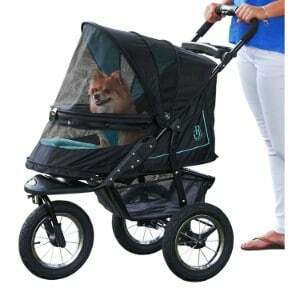 You will also love the wheels on this pet stroller. The wheels that are included with this stroller are able to travel along any kind of terrain including pavement, cement sidewalks and rough terrain like grass, dirt or gravel. In addition, the tires are equipped with what is called Air Ride. Air Ride gives extra comfort and what is basically a set of shocks to prevent your pet from feeling the impact from cracks or bumps in the road. This is a terrific stroller that is going to keep your pet comfortable while you are traversing long distances with ease and it has a large interior that your pet will be comfortable in. This is perfect for small or medium-sized pets. Second is the HPZ Pet Rover that is one of the most convenient pet strollers currently on the market. This stroller features a simple one-handed mechanism that allows you to fold or unfold the stroller without any effort whatsoever. This means you can hold your pet in one hand while you fold or unfold the stroller; in addition, being able to fold the stroller up to a very tight, compact state means that you can carry it around with you, strap it on your back or easily stow it in a closet or vehicle without it taking up any significant amount of space. Some of the other features of this stroller include a complete suspension system that is so strong that it could support the weight of a human being, comfort ride wheels with front wheels that rotate 360 degrees and rear wheels that have their own individual brakes for added safety. This dog stroller also has high-quality construction going for it with stainless steel tubes and aluminum alloys so it is going to last for many years to come. Plus, the breathable mesh cover make sure that your dog stays cool on hot days and still keeps out insects and other contaminants. There are also two pads inside the pet compartment that are made of high-density Oxford polyester fabric. They are stain-resistant and very comfortable; keeping your pet cool and you can wash them in a standard washing machine. Another great feature is that you can change the size of the compartment to fit different sizes of pets. For example, if you have a small dog and a medium dog, you are able to adjust the inside compartment to fit your pet exactly so that he or she feels secure inside of the stroller. You get plenty of extra storage as well including tons of it under the basket, three accessory bags and a bottle holder. When you take your pets with you they will be riding in style with this stroller. Gen7 makes this Regal Plus pet stroller in an all-in-one package that can work for both dogs and cats. This is a really stylish stroller that is also extremely mobile and features a smooth, comfortable ride that your pets will not be able to get enough of. That’s due to fully convertible wheels in the front that offer 360 degree rotation and rear locks to keep the stroller from moving when you don’t want to. Plus, this stroller looks so good that you will be proud to push your pets up and down the street, into stores or through the park. But there are lots of other cool features to be aware of as well. For example, this stroller features a smart canopy the folds underneath the canopy hood so you never have to squeeze your pet against one side of the stroller when you open it. Plus, you get plenty of extra storage with a smart basket underneath your pet with a large rear zipper so that you can grab things out of the storage compartment very conveniently without worrying that they are going to fall out on the trip. This stroller works for any pet up to 25 pounds and offers visibility all the way around the stroller so that your pet will be able to look out and enjoy the scenery. This stroller is also extremely light and you can collapse it down to where it fits easily into the trunk of your car or above the hanging rack in a closet. You can even carry it with you in one hand while you take hold of your dog’s leash and walk them. In addition, this is one of the most affordable strollers on the market offering terrific style, convenience, portability and plenty of storage space all for a price that you will be surprised at. This may be one of the budget dog strollers on this list, but that does not mean that it doesn’t come through in all the areas that it should. When it comes to your dog’s comfort and safety, this stroller really delivers. This VIVO four wheel pet stroller is terrific in so many ways, providing a comfortable and stylish ride for your pet whether you are only going around the block or are going to be out all day. This is a durable and high-quality construction stroller with four thick wheels that make for a very smooth ride. There are three access points to load your pet (or unload them), each with a large, easy-to-use zipper on the outside with a huge interior that measures 19 inches by 12 inches by 19 inches. In addition, these strollers have padded foam bottoms that will make sure that your pet is always comfortable the entire ride. 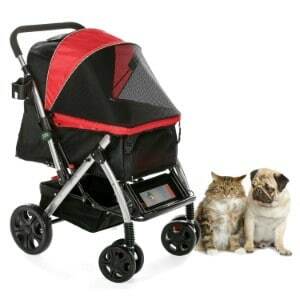 Breathable mesh surrounds this stroller so that your pet will be able to get plenty of air and see what is going on outside the carriage, and there is a top mesh window so that you can see what your pet is up to while you are pushing the stroller. There is even a convertible function where the top of the stroller collapses to create a large opening for when your pet needs some extra exposure to the sun. There are two different places that you can put a cup while you’re walking your dog in the stroller as well as a tray to use for dog treats or other items. The tray is even big enough for you to carry your keys or mobile phone. In addition, this stroller collapses down to almost nothing, allowing you to pick it up and carry under one arm or stow it in the back of your car easily. 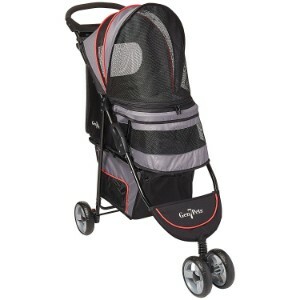 Two side latches collapse it instantly, and any pet up to 30 pounds will be comfortable in the stroller. There is a great deal of additional storage underneath the stroller with the 16 by 12 by 7 basket to fit everything you could possibly need for your dog or for a trip out with them. This stroller offers plenty of airflow, plenty of storage space and plenty of room for your pet along with durability and performance. Finally, the Paws & Pals City Walk n’ Stride model stroller is a super stroller that meets all of the national safety standards for one of the lowest prices that you could find a pet stroller for. The stroller also comes in two different colors – black and red – and it allows you to take your pet with you even if they are not able to walk. This is perfect for pets that suffer from arthritis and cannot take walks like they once did, pets that are suffering from a temporary injury or for taking your pet inside of stores that do not necessarily allow them to walk around freely. Whether you are taking a walk in the park or spending the day shopping with your pet this stroller is going to give you everything you need. The strollers feature multiple mesh screens all the way around including a large open area at the front and a wonderful viewing area at the back. There is also visibility on the front and rear sections of the sides right at the corners. This lightweight breathable mesh not only keeps your pet protected from insects and debris, it also gives them plenty of airflow to keep them cool and allows them to check out what is going on around them as the stroller goes down the sidewalk. The stroller also comes with cup holders and there is plenty of room underneath for you to store everything from a phone, tablet and car keys to entire picnic basket if you want. This stroller gives you everything you need at a rock-bottom price including portability; as it folds flat for easy transport. It also features rear security brakes, simple one-handed folding, a retractable, waterproof rain hood and both front and rear entry. There are a lot of good reasons to go with the stroller if you have a small or medium-sized pet that enjoys riding around or is not able to keep up on walks as well as they used to. There are a lot of things to consider when it comes to buying the right pet strollers. Dog carriages have features just like any other product that you get for your dog like an automatic dog feeder, electronic dog door, dog ramp, dog camera and more. If you want to choose the best dog stroller, then you’re going to have to look at all of these varied factors and decide what is most important to you and what features you need. Many of the features that we will be discussing below are already present in the dog strollers reviewed here. Whether you’re looking for a pet jogger stroller or stroller for dogs that are injured and cannot walk you will find plenty of options here including pet stroller reviews of some of the best products and all of the various features and accessories that you might find with the pet stroller. Having all of the information allows you to make the best buying decision possible, because the best pet stroller is the one that you have personalized to meet all of your needs and give you all of the features that you want. You will be able to pick a stroller that you and your dogs will love and will last for many years to come if you use the information in this buying guide to make a decision. There are actually some pretty compelling reasons to get pet strollers. For one thing, a pet stroller makes it easier to take your dog places. For example, next time you load up your puppy in a dog crate to take him or her to the vet, consider putting them in a dog stroller instead if your vet is close enough to walk to. If you are taking a bicycle, then you might need something similar like one of the models of dog bike trailers out there. Having your dog in the stroller also helps you take your pet into stores where they may not necessarily be allowed otherwise. In addition, dog strollers can help you go for a walk with your injured dog that is not able to keep up, and allows you to take your dog places like the park or a friend’s house without having to deal with a dog seatbelt or dog car seat cover. Another reason to have a dog stroller is that you are able to carry everything around with you. That doesn’t just mean your pooper scooper and poop bag; it means everything that root you might want with you on an outing including a jacket, your keys, your mobile devices, dog treats, your dog food container and more. Plus, dog strollers protect your dog’s paws when it gets too hot, and keeps your dog confined if there is some sort of situation where your dog would normally run off such as a loud noise or crowd of people. There are lots of good reasons to get a dog stroller and the reasons listed here are just a few of them. You have several types of dog strollers to choose from. One of the most popular types is dog strollers for small dogs. Lots of people have small dogs, and there is no doubt that they can have trouble keeping up when you go out for a walk. Small dogs actually tend to prefer to be carried around, and that’s where this type of stroller can come in. But they also make strollers for larger dogs. Generally, the largest dogs are not going to fit in any of the strollers on the market, but medium-size dogs can fit into a stroller easily and still have plenty of room. The rule of thumb is, if your dog can turn around within the stroller compartment, then it is probably big enough for him or her. They do make strollers that are larger than the ones for medium dogs, but they are usually not tall enough for larger dogs and instead are intended for multiple small dogs. You may be able to fit two or three dogs into your stroller at the same time and they can all hang out and relax while you push them around town. There are also strollers with all-terrain wheels that allow you to take them over asphalt, dirt, gravel and lots of other surfaces, as well as jogging dog strollers that come ready to be pushed at higher speeds. Finally, there are multifunctional strollers that are both safe and versatile and can be used in lots of different situations. The size of the stroller is also a consideration that you should be looking at. The size of the stroller usually refers to the size of the compartment where your pet will fit. This is often measured in height times with times length. For example, a common small dog stroller might measure 12×17×12 inches. The size of the stroller is important because it will let you know what size of dog you can fit in your stroller. The maximum weight that your stroller can hold is also a consideration. You want to make sure that your stroller is not going to collapse or stop working because you put a dog in it that was too heavy. That means that you have to know how much your dog weighs and how much the stroller can support before you start your trip. Generally, the max weight of a stroller will be pretty consistent with the size of dog that is recommended to ride in it, but this is still useful stat to have and you can easily find out by looking at the manufacturer specifications. In addition to maximum weight, you want to make sure that your dog stroller is constructed well. Just like indestructible dog beds or a dog gate, you want to make sure that your stroller is going to hold up against your dog over the long term. This is more than just the maximum weight; this is how much wear and tear is put on your stroller every time your dog gets in. You also have to think about if your dog is going to get any bigger in the near future. This will put additional wear and tear on your stroller as well. There are some additional animal stroller types that you should be aware of. There are strollers out there that are intended to be hauled behind bicycles, and then there are strollers out there that could be used to transport children and pets at the same time. They have separate compartments for children and pets, so that you can go for a walk and take your baby with you while still having your beloved pet in the stroller as well. Another type that you may not have known about is the combination stroller for pets that is a stroller, dog carrier and car seat all in one. These strollers convert into each type with a little finesse. How much the stroller costs is also a consideration. Whether you are purchasing a small item like a dog bowl or an outdoor dog kennel, you still want to be concerned about price. How much you pay will depend upon whether the stroller is worth it for the features that it provides. Most of the strollers out there with same features are going to be about the same price, but if you come across a stroller that is priced higher than the competition, then you want to make sure that you know what you are getting by spending that extra money. Here are some of the features of dog strollers that you want to be looking at before you buy. When it comes to a dog buggy, you want to make sure that you get the features that you need and the ones listed below will give you a good idea of what is available. How easy the stroller is to use is definitely a consideration. This includes all kinds of things from how easy it is to fold it up for storage to how quickly you can get your dog loaded or unloaded. It may also include things like whether you can access the underneath storage easily or how difficult the stroller is to push. Does the stroller offer any extra storage besides the compartment reserved for your dog? That’s a question that you definitely want to answer, because you may want to bring additional things with you when you go out with your dog. For example, you may want to bring an extra jacket, a picnic lunch, all of your mobile devices or anything else that you might need while you are out and about. What about features for the humans that push the stroller? Does it have a cup holder and if so how many are there? What about a phone pockets that you can easily slip your phone in where you know will not slide out and hit the ground? These are also good questions to ask when you’re looking at the features that a stroller provides. Whether the stroller is adjustable is certainly something that you want to be concerned about. If a stroller is adjustable, then you may be able to fit different sizes dogs in the same stroller. In addition, having an adjustable stroller can provide you with more flexibility for a dog that is just now growing up. Adjustability is probably not the number one concern for someone that already has a dog grown to full size, but it can be useful for certain dog owners. Does the stroller have the option to cover up the top or put on side panels to protect your dog when it rains? The best strollers have this option, allowing you to remove or replace panels that are waterproof to keep the rain off of your dog while still providing him or her with enough breathability inside of the compartment. Make sure that the stroller provides a rain hood at the bare minimum that you can easily remove or replace if it starts to pour. How easy or difficult the stroller is to transport is also something you want to think about. We have already discussed ease of use which includes breaking down the stroller so that it can easily be stored, but this also involves how heavy or lightweight the stroller is. Whether you can break it down and store it in the back of your car easily is something that you definitely want to consider because the best dog strollers are the ones that are the most versatile. Wheel brakes are also a consideration. There are actually a couple of things about the wheels that you should be looking at. Wheel brakes are typically on the back wheels and it prevents your stroller from rolling downhill or getting bumped and then taking off without you. But you also want to look at the front wheels and see if they provide a full 360 degree rotation. 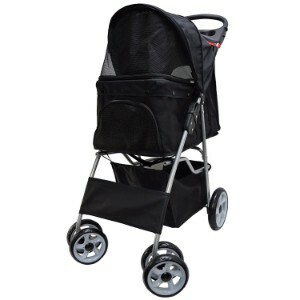 The best strollers provide this rotation because it allows you to easily take turns or move the stroller through a crowd without running into anyone or having trouble making turns. The bottom line is that there are plenty of things to consider when it comes to buying a dog stroller. Besides all of the features that are listed above, you want to be concerned about things like price, durability and whether it will actually fit your dog and serve your purposes. There are plenty of dog strollers on the market, and if you use these guidelines, you will be able to narrow down the ones that are available to get to the one that you want that has everything you need. Of course, that will depend upon knowing what you want in the first place, but once you figure that out this buying guide is sure to help you with the shopping task ahead.